Courtesy of Wikipedia. The fluorescent cousins of the zebrafish. Zebrafish are long, tiny (approx. 4 cm on average) aquarium fish that are making waves in health research. These small fish have a high regenerative capacity, making them more and more popular as a laboratory animal. They have participated in research involving cancer, cardiovascular disease, immune function, retinal damage recovery and drug development. Their entire genome has been sequenced which had led to the development of readily-available mutant strains for genetic testing. They are still not as common as rats and mice, but they are rapidly growing in popularity. They are a good starter aquarium fish, being small in size (you can get a couple, they like to have friends) and hardy. 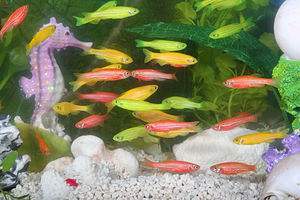 They also come in fluorescent colors (GloFish)! Set up a black light to watch your fish light up! Although not a common aquarium fish, you can see many varieties in your local pet store.